Marine Corps Sgt. Raheem Boyd was in his barracks room at Camp Lejeune, North Carolina, last May when a friend sent him an urgent message through Facebook. Another Marine had made some troubling posts, and while Boyd can't recall the exact words, they hinted at suicide. "It seemed strange," he recalled. "Just didn’t seem right," he remembers recalled." Boyd, who had known knew the Marine from a previous assignment in Okinawa duty station, immediately looked up the command’s phone number, dialed the duty office and headed to find the devil dog. The Marine’s barracks room was empty but a search was underway. Someone spotted him in his car in the parking lot with an assault rifle beside him. But as the searchers approached the vehicle, the troubled service member took off. Marine Corps Sgt. Raheem Boyd was recognized during an American Hero Award ceremony Dec. 23. Boyd took off after him, and when the Marine pulled into another lot, Boyd did too, placing his vehicle close to block any escape route. He approached the Marine, identifying himself and speaking calmly to him, with an eye to the weapon that was within arm’s reach. Boyd said it never occurred to him to think about his own safety. "This had been one of my junior Marines from Okinawa. We were all really close. I didn't feel like [the gun] was a threat to me," he said during a recent phone interview from Uganda, where he is deployed. When other vehicles — including police cars with their flashing lights — started filling the lot, the Marine panicked and reached for the gun. But Boyd reacted just as swiftly, hurling himself through the open window, pushing the gun away and locking the Marine in a bear hug. "If it wasn’t for social media, we never would have known what was going on in his head and he would have gone through with [suicide]," said Boyd told Military Times during a phone interview from Uganda, where he is deployed a heavy-equipment operator with Special Purpose Marine Air Ground Task Force Crisis Response-Africa. 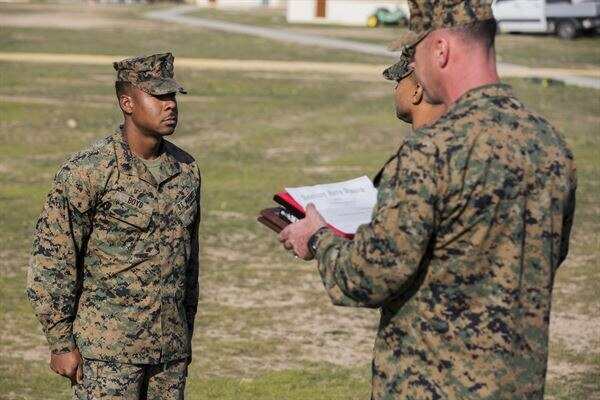 "My instincts and genuine concern for this Marine told me I needed to act." The Defense Department has not released an official tally of suicides among active-duty troops in 2015, but a Pentagon source with access to the data said the number was close to 290, including the 28 confirmed suicides by Marines from January through October. While the number of active-duty suicides has remained somewhat steady since it reached a peak of 321 in 2012, the rate — nearly 20 per 100,000 troops in 2014 — remains significantly higher than before Sept. 11, 2001, when it hovered around 10 per 100,000 service members, and the military appeared to offer protective measures against a rising suicide trend in the U.S. civilian population. In an effort to save lives and return to those lower rates, the military services and the Defense Department have waged a decadelong war on the problem, mandating suicide prevention training for personnel, spending millions to fund mental wellness programs and launching numerous awareness initiatives at all levels of rank and leadership. But the department also has been at the forefront of some notable suicide research, especially in the realm of social media. In 2015, the Defense Personnel and Security Research Center, working with researchers from Northrop Grumman and the University of Utah National Center for Veterans Studies, undertook two studies on suicide cues in social network posts. Social media's role in contributing to or preventing suicide has not been well studied, despite reports of deaths linked to cyber bullying, suicide clusters among online friends and numerous saves, experts say. "I wouldn't say there has been a lot of research. There has been some, most of it in other countries, but it's scant. It's hard to get the data the way that is needed for studies," explained Dan Reidenberg, executive director of Suicide Awareness Voices of Education. 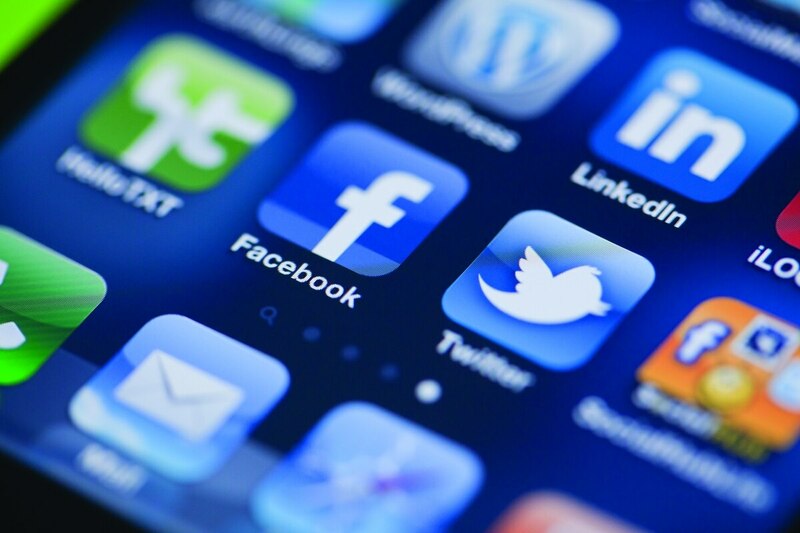 Keita Franklin, director of the Defense Suicide Prevention Office, said that with the DoD studies, the hope was that the research would be useful to integrate understanding of social media observations and cues into suicide prevention. "In these studies … we found similar things to things we already know about factors that contribute to suicide, including high financial stress, isolation, depression," Franklin said. "What we'd like to do is tell people not to ignore the signs, online and in life — get out of your own comfort zone." In phase one of "Indicators of Suicide Found on Social Networks," researchers looked at the suicides of 700 troops in 2010 and 2011 and compared them with a matched group of service members who died by means other than suicide in the same time frame. Narrowing the group to those with public social media sites — 315 service members — the researchers looked at their public posts up to a year before their deaths and also a month before they died. 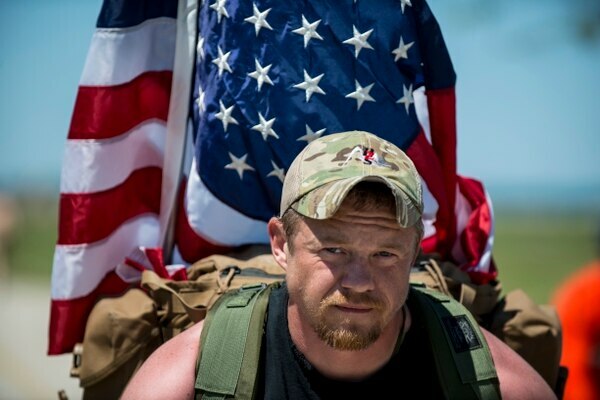 Army veteran Justin Vititoe, former sergeant first class, marches in the Chicago Honor the Fallen Ruck March last May. Approximately 450 military veterans, service members and supporters gathered for a 22-mile ruck march to honor military men and women who suffer from post-traumatic stress disorder or have committed suicide. They found that those who died by suicide were most likely to show indications of hopelessness, social withdrawal and insomnia the year before, and 30 days prior, were more likely to discuss general distress, relationship problems and religious affiliation. In the study's second phase, the researchers looked for recurring themes in the posts to try to identify those who may be at risk for suicide. In the year before, the suicide group expressed a more pessimistic outlook on life than those who did not die by suicide and/or had a social network that communicated a "more pessimistic worldview." They also were more likely to avoid interpersonal situations, lacked interest in social activities and frequently discussed sleep problems, according to the study. Examining the posts 30 days before death, the suicide group frequently expressed generalized stress and posted about relationship problems. Surprisingly, though, they were less likely to communicate feeling any anger, which "may suggest the service member had "resigned" themselves to their situation," according to the researchers. "These clues on social media are very consistent with what we see are the warning signs in life — expressing their intent to die, hopelessness, a sense of being a burden and having no purpose in the world. It's just another way for us to communicate," said Reidenberg, who did not participate in the research but has been working with the International Association for Suicide Prevention to develop guidance for bloggers and "citizen journalists" on writing about suicide and the Internet. The telegraphing of suicidal intent has not escaped military personnel and veterans in their online lives. After a number of high-profile farewells in the past five years, including at least one by a Marine who documented his death on Facebook in 2014, groups have formed on various social media platforms to reach personnel in crisis. The nonprofit "Battle in Distress" was founded after Army National Guard Sgt. 1st Class Dan Caddy received a cry for help in 2012 regarding another guardsman in crisis, while the Durkheim Project, a collaboration by the Veterans Affairs Department and the Geisel School of Medicine at Dartmouth, offers an opt-in program monitoring veterans' posts on Facebook, Twitter and other social media for warning signs. A number of veterans-only social media sites have popped up, as have informal friend- and unit-based groups. A series of New York Times articles last year documented the ongoing efforts by former members of 2nd Battalion, 7th Marine Regiment, to keep tabs on their fellow Marines, 13 of whom have died by suicide since the unit deployed to Helmand, Afghanistan, in 2008. In at least two cases in 2/7, veterans rallied to respond to posts by their fellow Marines that they were "done with life" or they "can't do it anymore." A swift response to the posts helped save one of the service members' lives. "The upside to this is that social media gives us the opportunity to intervene because there are so many people involved and it can be done so quickly. That's the real benefit," Reidenberg said. In 2015, Facebook introduced a feature for reporting suicidal content that provides support to the person who created a concerning post as well as those reporting the content. A user can send messages to a troubled friend through the option or reach out to a fellow friend who might be located closer physically to the friend in need. It also can send messages to the person who posted, telling them someone is concerned about them and providing links to the National Lifeline, suggested friends to speak to or tips for dealing with stress. "People say, is this going to make them mad, is this going to upset them? No. The reality is when someone is struggling with thoughts of suicide, you have to connect with them at that level — you have to reach them where their head is at. So, having things like [the Facebook reporting] allows them to engage and be part of something … those are the kind of things that are going to help someone through that situation," Reidenberg said. The recent DoD studies yielded several recommendations to improve the department's understanding of suicides and prevention, to include integrating social media data in psychological "autopsies" conducted after a service member dies by suicide and figuring any publicly available social media data into wellness assessments. The research also suggests the department add social network awareness and response to its suicide prevention training for troops and commanders and continue to promote lifestyle choices and factors that can bolster resilience. "This study found evidence supporting established risk and protective factors, including positive family interactions, having children, engaging in sporting activities, animal companionship, gratitude, access to lethal means, and employment issues," the authors wrote. In saving a fellow Marine's life, Boyd said he relied on his own gut instincts as well as compassion to intervene. But he also recommends service members pay attention in their annual suicide prevention classes, as trying as that might be. "I think for a lot of Marines, [the suicide prevention training] goes in one ear and out the other, because they think it's not going to happen to them or they will never be in that position. But listen. It does help. You need to act," Boyd said. The Veterans Crisis Hotline is staffed 24 hours a day, seven days a week, at 800-273-8255, press 1. Services also are available online at www.veteranscrisisline.net or by text, 838255. Patricia Kime covers military and veterans' health care and medicine for Military Times. She can be reached at pkime@militarytimes.com.